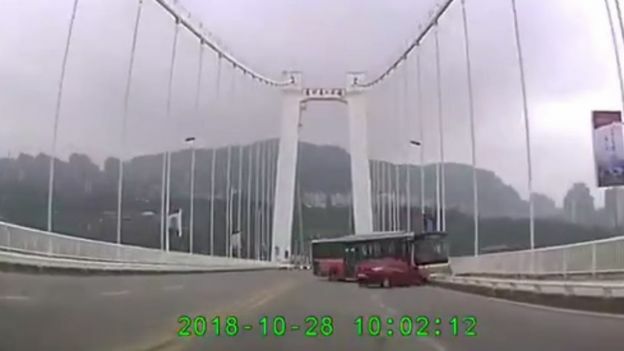 Previous reports said the bus swerved to avoid hitting oncoming vehicle but a new footage shows the driver was being hit by a passenger when suddenly losing control on the wheel and turns into the opposite lane and smashes through the safety barriers. According to police the passenger was identified as a 48-year-old woman with the surname Liu who was angry and hitting the driver with her mobile phone when Ran the driver refused to stop and let her off. There were no report of survivors when a huge rescue operation was mounted with teams of divers and dozens of boats and cranes were deployed. Bodies of some of the passengers were retrieved by divers last Wednesday night together with the wreckage of the bus from a depth of 71m.